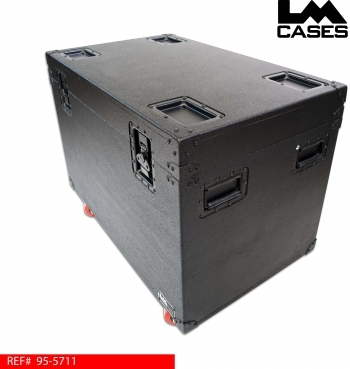 This trunk is designed to be the backbone of your show, pack your heaviest cables inside and stack gear on top; this trunk is designed to take any abuse you can throw at it. The trunk is built out of 3/4” Baltic Birch that is glued, stapled and screwed together. The case sides feature interior wood cleats for additional strength and the case lid features 3/4” Birch alignment strips to keep the case square even under extreme load. 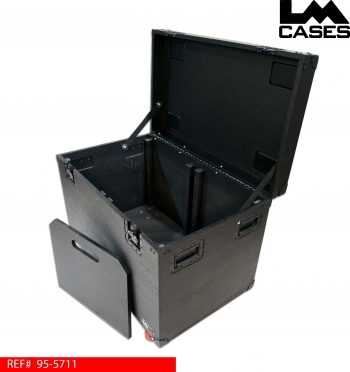 The case features a removable 3/4” Baltic Birch divider that splits the interior in two equal compartments. 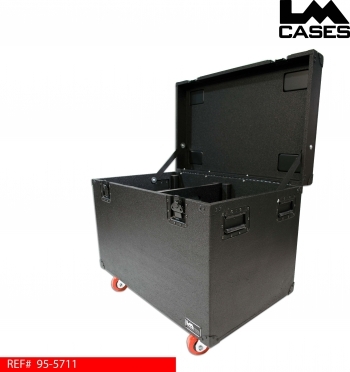 To add rigidity, the case employs a 1.5” thick bottom and 4” x 2” Colson Encore casters. All hardware is double recessed into the exterior to provide as flat of an exterior surface as possible. The case exterior is finished in black texture coating and features black powder coated hardware to help the case blend in backstage environments. Maximum OD case dims including corners and casters: 40" wide x 24" deep x 31.875" high.